In an unprecedented move, Donald Trump refused to release his tax returns, both before the election and after his inauguration, perhaps hoping people would eventually forget about it and move on. But thousands of people showed up on Tax Day to prove that they have not forgotten, and they will not move on. Donald Trump headed out of town to spend another long weekend at his Florida estate — his seventh trip there since taking office — at an estimated cost to taxpayers of $3.6 million. 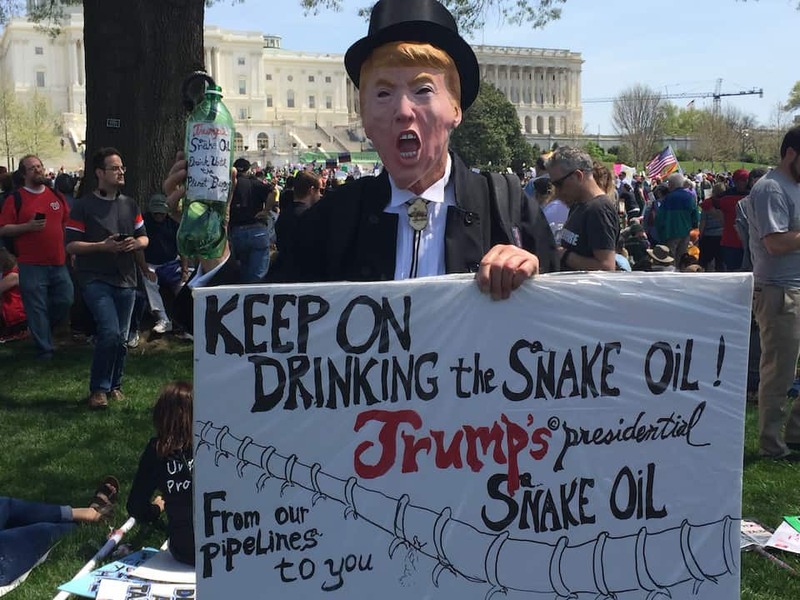 Not that anyone would blame him for wanting to avoid the protesters who gathered in front of the U.S. Capitol on April 15 to demand the president release his tax returns and show the public exactly what his super-secret and increasingly suspicious financial involvements — and conflicts of interest — really are. 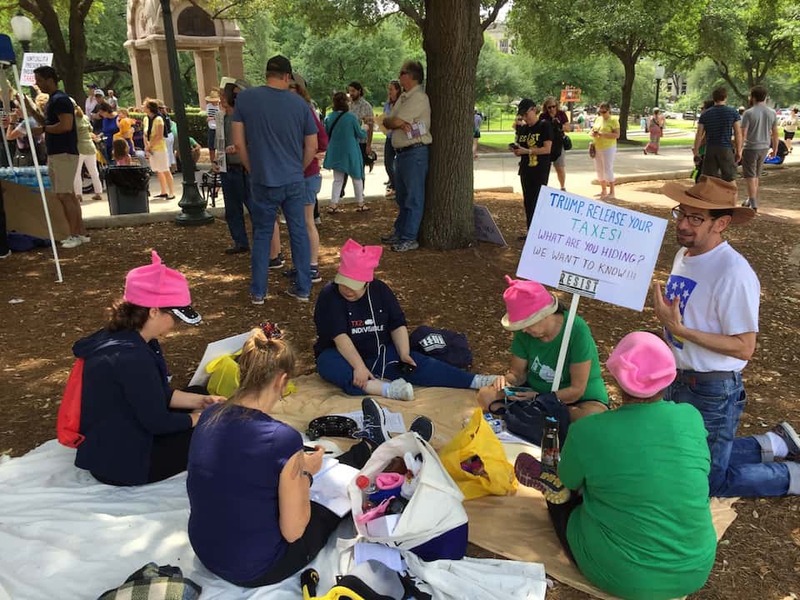 Protesters held homemade signs, wore pink knitted hats, and demanded Trump's taxes, his impeachment, and transparency about his financial ties to Russia. Many remarked on Trump's failure to pay federal taxes. "It just makes me angry," said Stephanie Diehl, a mother of two preschool-age children from Arlington, Virginia. "Ethics is the most important thing, whether you're the president or just an average American." Diehl, who said she never cared about politics before this election, said this is her third march since Trump's inauguration. "I resist everything about what the president is trying to do," she said. "He's a narcissist, a bully, and a cheater. He doesn't represent what's good about America. He's a national embarrassment." Diehl added that she has been inspired to join the resistance to set an example for her children so when they are older and learn about the Trump administration, she can tell them she took a stand. "I'm going to keep going as long as we have to," she said. Activists organized the Tax March in DC, with satellite marches around the country, to demand transparency from the president whose young administration is already embroiled in scandal, including serious questions about how he is using the office of the presidency to enrich himself and his family. But it is also more than that. "The Tax March signifies something more than thousands of people gathering across the country to demand transparency from the president in the form of Trump's tax returns," said Delvone Michael, Tax March Executive Committee member and senior political strategist with the Working Families Party, in a statement to Shareblue. "It shows that people are fired up about holding Trump accountable, and about achieving a fair tax system for our country. And it shows that we won't stop making our voices heard on the issues that matter to us." As the group notes, Trump was the first major-party presidential candidate in 40 years to refuse to release his tax returns during the campaign, keeping his actual worth and investments a secret. Meanwhile, according to the New York Times tracker, he has thus far spent a third of his presidency at Trump-owned properties — the Trump International Washington, Mar-a-Lago, and several private golf clubs that bear his name — which gives enormous free publicity to his businesses. 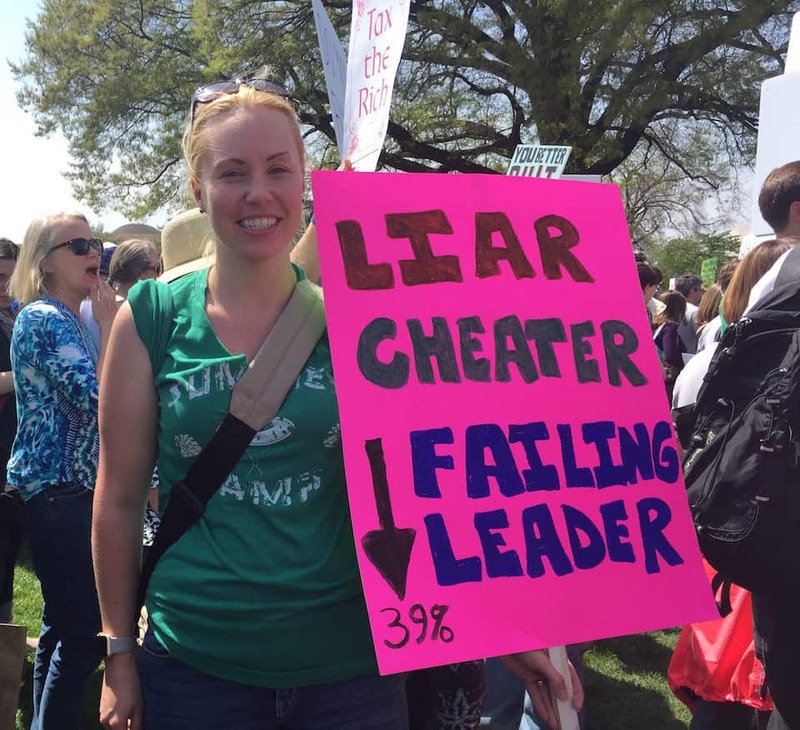 The Tax March for transparency is especially timely, and not only because it is the day regular Americans must pay their taxes, despite having a president who bragged during the campaign that he has not paid federal income taxes in years. Earlier in the week, Citizens for Responsibility and Ethics in Washington (CREW), the National Security Archive, and the Knight First Amendment Institute at Columbia University filed a lawsuit seeking access to the White House visitor logs, which were made public under President Obama but have been kept secret since Trump took office. The White House later said it had no intention of releasing that information. Then, on Friday, the administration announced it is shutting down Open.gov, the site that publicly tracks White House visitor records, staff financial disclosures, and appointments, supposedly as a cost-saving measure. But as Shareblue reported, terminating the contract for Open.gov saves a mere $70,000 through 2020, a paltry sum compared with the money the Trump family is costing the taxpayers for frequent weekend trips, the additional cost for Melania Trump to maintain a separate residence in New York, and other expenses unique to this president. The cost of Trump's vacations and frequent golf trips was a common talking point at the march, especially when Rep. Maxine Waters (D-CA), one of Trump's fiercest critics who has repeatedly called for his impeachment, took the stage to address the crowd. "I want to thank the Resistance," she said. "We came to show Donald Trump we will not be quiet." As the crowd cheered and chanted, she continued. "You can flip-flop and flop-flip, but we are on your behind!" Waters left the stage to a passionate chant from the crowd: "Impeach 45! Impeach 45!" Trump can continue to jet off to his home in Florida, on the taxpayers' dime, but he cannot avoid the multiple investigations, lawsuits, and mounting questions about his time in the Oval Office and the extremely concerning, and perhaps even treasonous, actions he might have taken to get there.